A unique piece need not cost a fortune. If you have a special anniversary coming up and want to mark it, send us an enquiry. 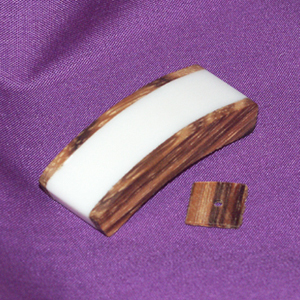 I recently received a sample of an Ivory Substitute manufactured in Germany called "Elforyn"® which I intend to combine with Rosewood or Ebony (or both). A variation on the Ebony & Ivory theme, this cocktail watch is only 14mm wide with an 8mm wide Stainless Steel Bracelet. 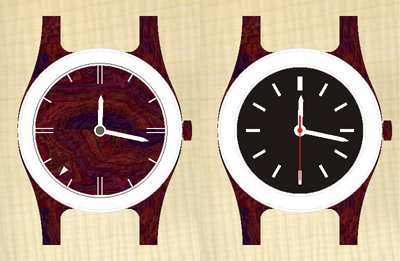 The Ebony one will now have a White Calf Strap and the Zebrano one a Gold Plated Expanding Bracelet. 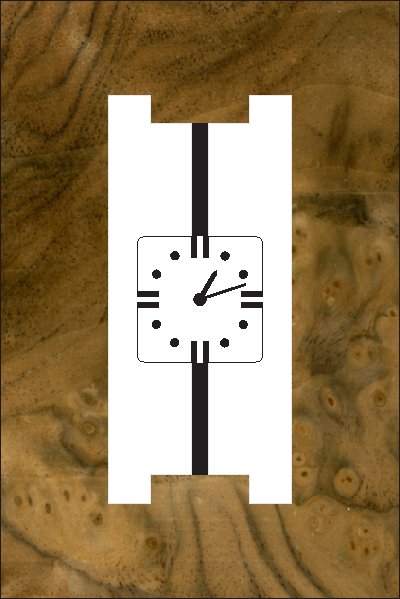 This design uses a man-made Tortoiseshell alternative to house a Citizen Quartz 'Big Date' movement. 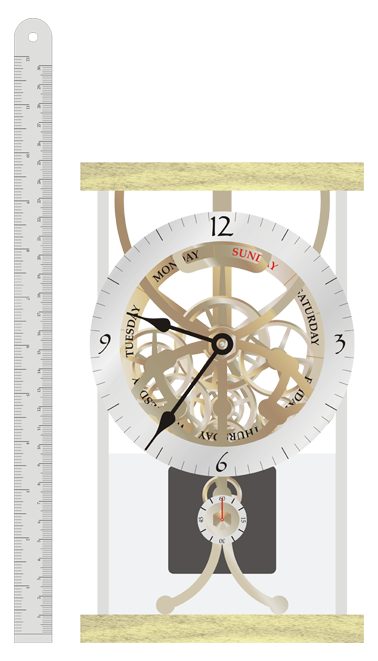 The seconds hand is a simple pointer on a clear Plexiglas® disc. The Hour markers are Nickel-Silver and the minutes are 0.25mm wide slots cut into the Rippled Sycamore dial filled with Garnet Shellac. May 2006 The 'Big Date' Movements are ordered but delivery is currently unknown due to it being a very new Movement from Citizen. When they arrive the first watch using them will be Black Palmira with Shark-skin Strap, Stainless Steel Deployant Clasp and Orange Swampwood Veneer Dial. The Citizen/Miyota 1M52 movement hs now arrived so click here to see the construction progress. 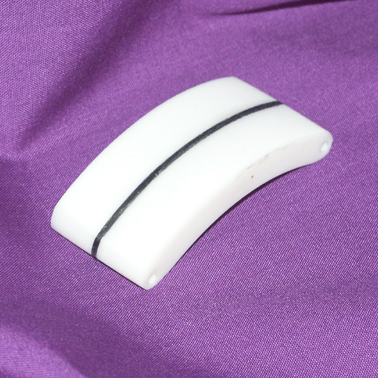 A further Ivory alternative based design giving more prominence to the 'white'. The strap for this will be white Calf. On hearing about the engagement of my Niece I rashly said that I would make a clock for the occasion of her marriage. 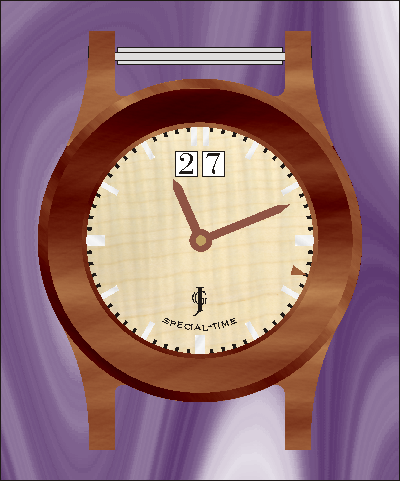 My thoughts were something along the lines of a Sycamore and Walnut case with a Radio corrected Quartz movement but knowing her flare for design I wanted her to have some input. When she came back with "Something modern with Stainless steel and/or brass . . . Oh, . . . it would be nice if you could see the movement" . . . I had to take a step back and re-think. Shortly after this a 'flyer' came in my post and dead centre on the front was a skeleton clock movement ready made complete with dial/hands/case which I could quite easily incorporate into a new case of my design. I bought two (just in case) and proceded to investigate the best way to extract just the movement. Within 15 minutes I had destroyed the first - but I now had no compunction about taking the whole movement apart. I knew it was a quartz movement but was surprised to see how simple the driving force was. Thoughts now turned to the posibility that I could make a quartz unit with a solenoid acivated each second and drive my own gears - the fact that I didn't have any knowledge of quartz crystals or a means of making gears was secondary - there now seemed a way that I could in fact conform to all the criteria that had been imposed upon me! As an aside, I'm amazed to find that this cheap skeleton movement is keeping extraordinary good time - after three weeks the second unit is about 2 seconds fast. I now set about investigating quartz crystals and solenoids but quickly found that 'experimental electronics' is all but dead in he UK and any components that I might get were going to be 'silly money' or from the USA (with all the problems that would entail). It occured to me that I already had access to a ready built quartz movement and not only that it was a radio corrected one (as used in 'The Giant'). It seemed that instead of puting a hand on the minute spindle I could put a gear and that could then drive a train essentially 'reverse engineering' all the hand movements. There would be issues of friction and torque but if I took all measures to minimize the friction then the amount of torque available would not be a problem. 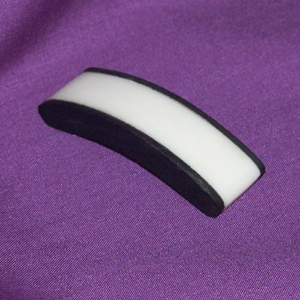 Friction is caused by rubbing between mating components and under normal conditions gearing ought to be in constant contact to reduce 'backlash'. In clocks of course backlash is not a problem because power is applied in only one direction (even in those which are designed to run backwards) so actually designing to include extra backlash (space between gears) is perfectly acceptable. After many hours drawing gears of appropriate ratios and suitable 'skeletal' plates to hold them in place I have now created my third design which I am now preparing to manufacture. Many spindles and gears have been cut to test the vibility of driving this gear train 'in reverse'. Prototype plates have been made from Aluminium with spindle breaings in Brass inset and the whole of the seconds train is under test. The good news is that it works . . . . . . after a fashion . . . . . . . for a few days it seemed that it would not work at all because it would stop after less than 2 minutes but with just a 'tap' it would start again. The real issue is that the seconds are not indicated evenly - often there are three seconds delay, sometimes two. So overall I think that the movement does not have sufficient torque to drive the seconds hand from the minute hand. Another isue is the overall size of the finished unit - at over 12" high I think it is too much. I've now re-designed it (Skeleton 4) using a 0.5MOD Cycloidal Hob which should have a number of advntages but in addition I'm now going to drive everything off the seconds spindle of the Quartz Movement. 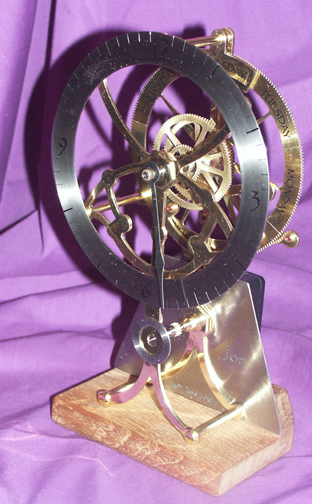 My original objection to this approach was that I could not thread the spindle but I now believe that I can make an extention to the movement spindle which is a friction fit and that will have the seconds hand attached directly to the other end - no 'centre seconds' but I consider that a small price to pay. To even up the gearing, I've added a 'Weekday' complication. The part completed unit was displayed at the wedding, the Bride & Groom were suitably surprised and appreciative of the design which no longer has the heavy top with stainless steel support pillars. During assembly it was discovered that some of the gears had not been cut deeply enough - despite accurate measurments being taken of the root diameter - so I had to find a better way to determine the required depth. 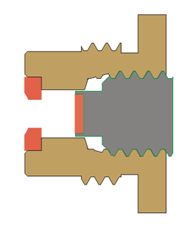 Simply feeding the hob onto the gear blank, checking contact with a feeler gauge and then feeding until the calculated root diameter had been achieved was not accurate. I determined that feeding to the calculated tooth depth (by reference to a plunge action clock) after contact, without taking account of the measured root diameter was much better. Watching the corrective action of the other Radio-Controlled movement in the 'Giant Watch' I've noticed that there is a tendency for it to roll forward by 12 hours to correct a small 'forward' error. ie. if the received time signal is 12:00 but the current display is 12:00:30 then it rolls forward 11H 59M 30S - This would be a disaster as far as the 'Day Wheel Display' is conserned since it would roll forward half a day! In view of this I've decided to dispense with the accuracy of Radio Control and fit a simple quartz movement. After a long period of inactivity I have returned to my workshop and addressed the problems I was having completing this project. Essentially I simply couldn't fit all 11 spindles at the same time - this was due to a basic design fault, ie. fixed jewel housings. Getting 5 spindles in place prior to screwing the front & back plates together was achievable so I needed to find a way to complete that before fitting the other 6. This meant designing a new jewel housing that could be fitted after the plates were screwed together. The major difficulty here was that there was very little space available between the back plate and the 'day' wheel . In fact viewing the drawings again I could see 1.5 mm available. A chance sight of fine pitch taps on an engineering supplies web-site prompted me to look seriously at making a housing for the 1mm ring jewel that screwed into the back plate and then a further modified grub screw to hold the end jewel. A sectional view of this can be seen to the left.